to improve its infrastructure, New Mexico is trailing the nation in high-speed availability. Yet, high-speed service, or broadband, is available in many regions in the Land of Enchantment. 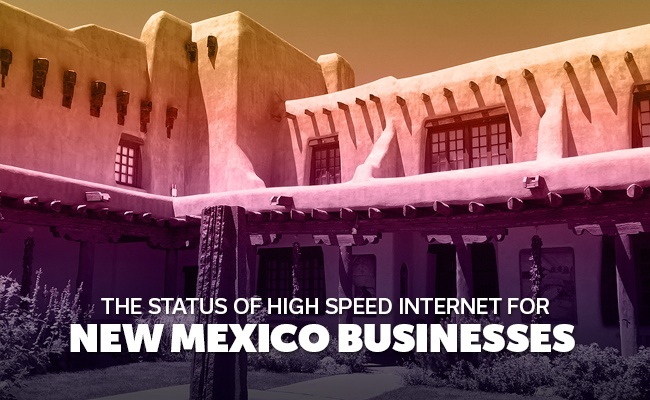 Read on to learn about the status of high speed Internet for New Mexico businesses. Internet service providers (ISPs) are firms that sell online access. These companies often include free email accounts and offer television and Voice Over Internet Protocol (VoIP), or online telephone service as well. By bundling these products, subscribers pay less overall. Initially, broadband was only available to institutions with business information technology (IT) infrastructures, such as government agencies and college campuses. Today, everyone can access the Internet, but to exploit more advanced business technology features, firms pay more for their own designated Internet Protocol (IP) addresses. This is one difference between business computing and residential service. Although commercial and residential broadband are not the same, the differences are not as pronounced as they were in the past. Internet service provided for business IT use surpasses residential quality and support availability. Downtime for a business is more than an inconvenience; it can cause revenue loss. Businesses also need faster upload speeds to share and publish content and designated - or static - IP addresses, which are shrinking in availability and rising in cost. Today, residential subscribers use features such as video conferencing and file storage, however, the residential equivalents are not as robust as their commercial counterparts. In smaller cities around New Mexico, the high-speed Internet infrastructure is still under construction, and broadband availability varies by location. New Mexico legislators are working to lessen the region’s digital divide. In the meantime, firms hungry for an Internet framework that can support business information technology workloads welcome the government’s push for a broadband build out. Santa Fe area officials want to solve two problems at once by connecting a new broadband line with the regional telephony exchange, which runs concurrently with the city’s Internet backbone. As of 2016, New Mexico ranks among the three most unconnected states in the US. However, many New Mexico firms and institutions need the computing power provided by faster Internet access. Additionally, a more current infrastructure means cheaper Internet service for residents and businesses. For many New Mexico businesses, there is a solution. Most cities and towns in the state do have the underlying infrastructure to support high-speed data transfer, however, these networks do not extend to all areas. If you own a business in a well-connected area, you most likely have access to a few business class ISPs – information easily revealed with an online search. Here is a link to a list of ISPs for New Mexico: http://internetprovidersbyzip.com/states/NM If not, you may have to decide if superior data speed is worth relocating. New Mexico legislators continue their work bringing regional Internet service on par with national standards. The technology, formerly reserved for special interests, is now available to most consumers. However, firms with business information technology infrastructures need more than residential broadband can offer. Despite this, it may take time before the broadband is universally available in the state.